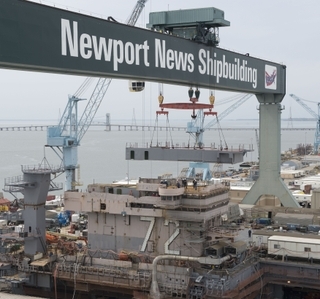 NEWPORT NEWS, Va. (Nov. 5, 2014) -- With tugboats guiding it into the James River, the aircraft carrier USS Abraham Lincoln (CVN 72) was moved from one of Newport News Shipbuilding’s dry docks to an outfitting berth on Monday. 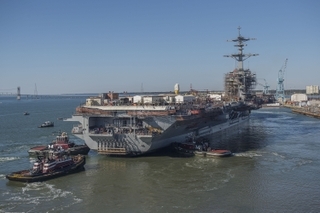 With this move, Newport News, a division of Huntington Ingalls Industries (NYSE:HII), officially completed the dry dock portion of the carrier’s mid-life refueling and complex overhaul (RCOH). Now at Outfitting Berth 1, the carrier will undergo final outfitting and testing. During the dry dock phase of the RCOH, Lincoln underwent extensive repair and construction work both inside and out to revamp the ship. Inside, Newport News shipbuilders re-preserved hundreds of tanks and replaced thousands of valves, pumps and piping components. On the outside, they painted the ship’s hull, updated the propeller shafts and installed refurbished propellers. 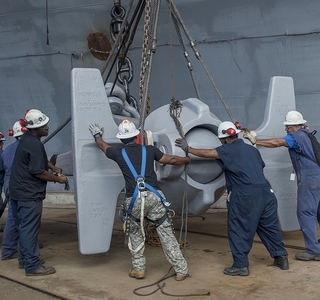 For these last 24 months before the carrier’s re-delivery, shipbuilders will finish up the overhaul and installation of the ship’s major components and test its systems. 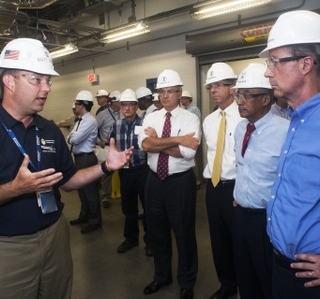 Shipbuilders must make sure that the electronics, combat and propulsion systems are all operational before the carrier is re-delivered to the Navy in 2016. These final months will also be dedicated to modernizing the ship’s living quarters and making them habitable for the sailors as they move aboard. The first group of sailors began moving into the living spaces on Oct. 23. Lincoln arrived at Newport News in March 2013 for its RCOH and is on track to redeliver in 2016. RCOH is the mid-life refueling overhaul and maintenance availability of a Nimitz-class aircraft carrier that produces a recapitalized carrier capable of supporting current and future warfare doctrine. Once Lincoln’s RCOH is complete, the carrier will be equipped to operate in the U.S. Navy fleet for the second half of her 50-year expected service life.